Jordan Matthews was fired up. 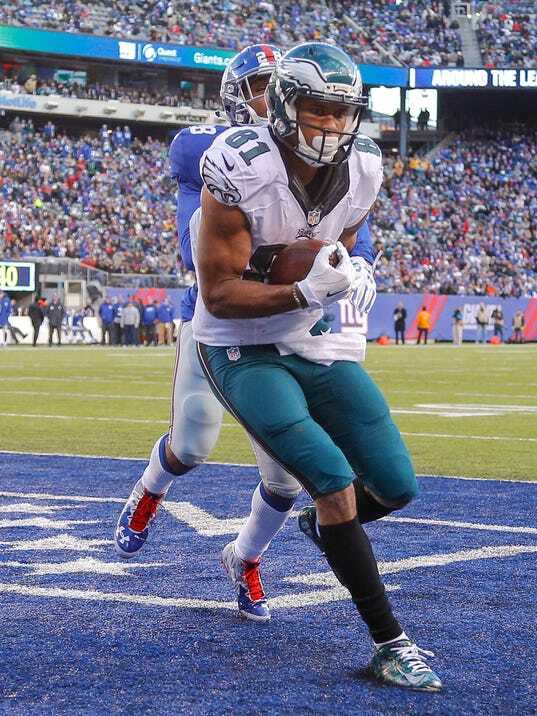 The Eagles' second-year receiver hasn't been afraid to show emotion after making big plays. It was no different during Philadelphia's season finale Sunday at MetLife Stadium against the New York Giants despite both teams already being eliminated from the playoffs before a single snap occurred. That didn't matter to Matthews. After hauling in a 4-yard touchdown pass from quarterback Sam Bradford to cap a 16-play drive – the Eagles' longest of the season – and put them ahead 21-13 late in the second quarter, Matthews hurled the football off a wall in the corner of the end zone. It was only the beginning of his touchdown celebration, which featured a Rocky-esque shadow boxing routine. An animated Matthews then ran to the Eagles' bench and continued to prance along the sideline among his teammates, clearly amped from the scoring sequence. Within the context of the overall season, Matthews' touchdown didn't mean much in that moment beyond extending the Eagles' lead. But it provided a glimpse of Matthews' mentality, which is important in an underachieving season by the Eagles. "We're from Philly so you've got to fight. I don't care what the situation is," Matthews said after the Eagles' 35-30 win. " ... Everything's a building block. It [stinks] that we don't get to play any more games. It's very disheartening and very disappointing, yes. But at the same time too, you have to go out there every single time and represent that team that's on the front of your chest. "We're not about to go into a game that some people think doesn't matter and lay down," he continued. "That does nothing for nobody. I know everybody thinks about draft picks and things like that and all those things, but you've got to make sure the guys in the locker room right now have the heart and soul to go finish a season and go finish a game." The Eagles have been missing big personalities since former coach Chip Kelly made personnel changes and sent some of the team's best players out of town. Matthews, however, has the opportunity to fill that void. He's capable of adding swagger to an offense that has been missing that extra juice at times in a season that saw the Eagles limp to a 7-9 record. With Kelly gone, Matthews' personality should be able to shine under a new coach. If he plays smart and doesn't get let his emotions get the best of him on the field, it should benefit the Eagles next season. He's capable of energizing a team, which is exactly what the Eagles need from a legit No. 1 receiver. Matthews finished with seven catches for 54 yards and two touchdowns against the Giants. His 3-yard touchdown reception with 9:19 left in the game extended the Eagles' lead, 35-27. "Sam trusted me in the red zone," Matthews said. "That's the kind of guy I want to be. Play winning football. Come to me in big times during games. Come to me, find me – I'm going to help you win games." Matthews ends the year as the Eagles' leading receiver, recording 85 receptions, 997 yards and eight touchdowns. Those 85 receptions tied him for fourth most in a single season in franchise history and third most by a wide receiver. Matthews is already establishing himself among the best wide receivers to wear an Eagles uniform. Among all Eagles players through their first two seasons, the 23-year-old Matthews ranks first in receptions (152), second in yards (1,869) and second in touchdowns (16). Those 152 receptions also rank the 10th most in NFL history by a player in his first two seasons. Matthews isn't done growing as a football player. His faults have been glaring at times, particularly with his all-too-frequent dropped passes. He had another drop Sunday on a perfect deep throw from Bradford early in the first quarter, a ball that hit Matthews' square in his hands and fell incomplete to thwart what could have been a long touchdown. Those types of plays can't happen as frequently as they do with Matthews, and he knows that. "Going into this year, losing [Jeremy] Maclin, that was a serious blow," Matthews said. "You don't want to make excuses, but obviously that really affected us. ... When that happened, there was definitely a shock factor to it, being thrusted into that position. There definitely had to be some growing pains, some discomfort, but at the same time, my mentality throughout the season and now at the end of it, I really felt like, OK, it's that time to make that step and step up and be the No. 1 receiver for this team and for this city. "Everyone's asking me about the 1,000 yards [mark], and I think it's fitting I ended the season that close because now that makes me even hungrier going into the offseason. That's the type of attitude I want to have." Matthews has the potential to be a star in the NFL. He possesses the charisma, talent and desire necessary to be among the best in the league at his position. Matthews isn't shy in front of cameras or microphones, either. He spent 20 minutes talking after Sunday's game, seemingly the most of any of his teammates, and handled the variety of questions with poise with topics ranging from the Eagles' shortcomings this season to the type of coach he'd like to play for next season. It's a responsibility that comes with being a leader and isn't something he has shied away from. He readily admitted Sunday he wants to be one of the faces of the Eagles' organization moving forward. Matthews already talks and dresses the part, even delaying the start of his postgame interview following the Eagles' win until a reporter helped him fix the collar on his black blazer. It's his attention to detail, on and off the field, that has helped turn Matthews into one of the best young receivers in the game, and, if he has his way, will make him one of the best players in the NFL.